The Olympics may be about peace, camaraderie, sportsmanship and all that stuff. But the other thing they're good for? Alerting us Americans to the fine, fine athletic specimens that other countries boast. 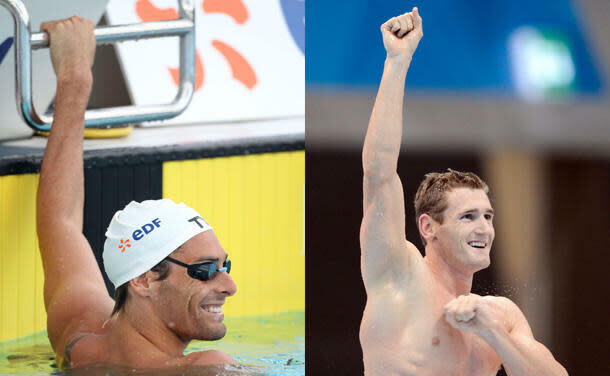 Case in point: South Africa's Cameron van der Burgh and France's Camille Lacourt. We'll start with van der Burgh. The 24-year-old crushed the rest of the 100-meter breaststroke field on Sunday en route to a world-record time of 58.46 seconds. 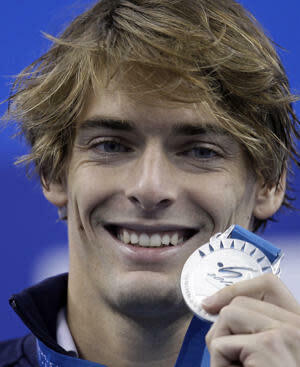 He won South Africa's first gold at the 2012 Games and became the first man in his nation's history to win Olympic gold in an individual swimming event. And he seems like a sweetie pie, too. After his race, van der Burgh lay on the lane line for ages (giving NBC's cameras plenty of time to linger on him, thank goodness) and smiled skyward, thinking of his good friend, Norway's Alexander Dale Oen, who won the world title last year but died suddenly in April of heart disease. And then there's Lacourt, who came in fourth on Monday in the 100-meter backstroke, which saw Americans Matt Grevers and Nick Thoman clinch the top two spots. The Frenchman looks like he should be on "Gossip Girl" or "Vampire Diaries" (or any number of CW shows).